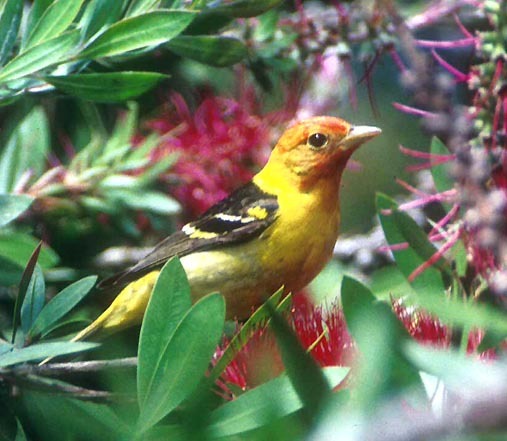 The WESTERN TANAGER is a common breeder throughout the mountains of California. It is widespread in migration, spring and fall, and can sometimes be encountered in "waves," especially in April-May. A few winter, mostly along the coast and especially in southern California, in exotic vegetation (e.g., eucalyptus or bottlebrush). I see many Western Tanagers every year, so I do not list any specific records. Winter birds are the most scarce, but I've seen a handful in winter along the coast from the San Francisco Bay area to Santa Barbara, Los Angeles, and San Diego.